We made our own Christmas Cakes for our families or even Santa! We followed the recipe and added all the ingredients and then decorated them the following day! Mila 'creamed' the butter and sugar together. Charlie made a wish when he mixed the mixture! 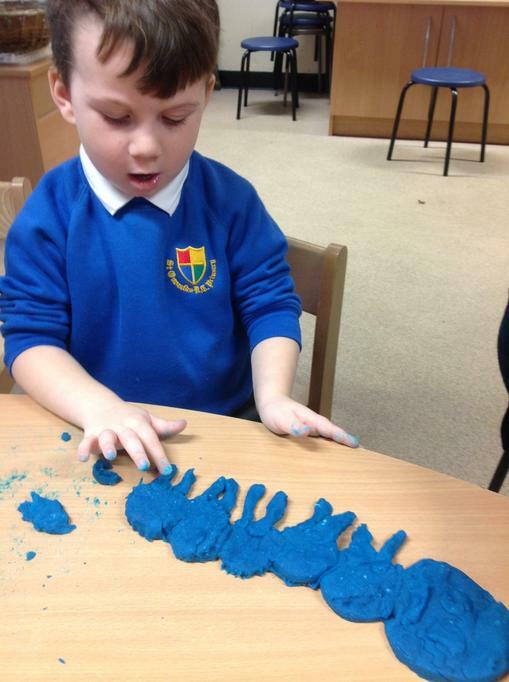 We painted the stars with food colouring. Corey added the special syrup! We had a great day visiting West Boldon Lodge. We were met by 'Jingle' the Elf who helped us become trainee elves! We decorated our own Santa hats. We walked quietly across the bridge. Across the Candy Cane bridge. The naughty elf had hidden all the jigsaw pieces! Phoebe found a piece of jigsaw! 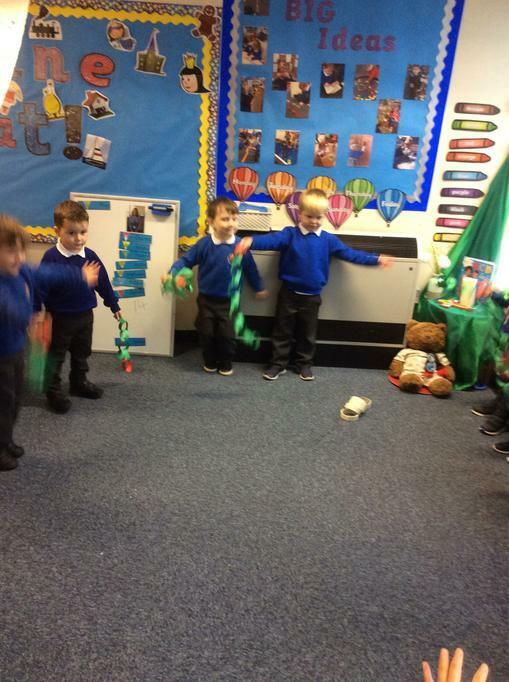 We followed Jingle to the campfire! Jingle gave us a toasted marshmallow! We went inside for hot chocolate! Jingle showed us how to make a decoration. Blue group on Santa's sleigh! We helped Santa deliver the presents. We had to quickly pass them to each other! We put them under the tree. Harrison thought the big present was funny! We went into Santa's Grotto! Santa looked to see if we were on the good list! He read us a lovely story! 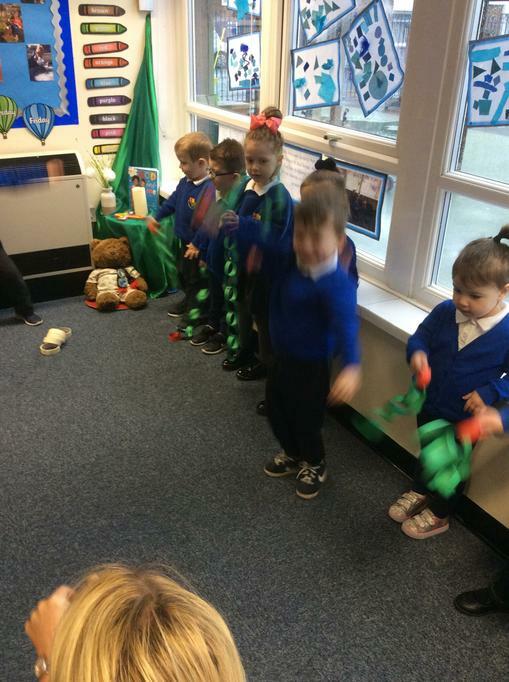 This week in Nursery we have been working hard to prepare our Nursery for Christmas. We learned about the season of Advent, and how it means preparing for the birth of Jesus. We decorated the Christmas tree, and hung decorations. Some children were inspired by the spiky trees they have seen, and made a representation of these spikes using wooden blocks in a zig zag arrangement. Great work everyone! 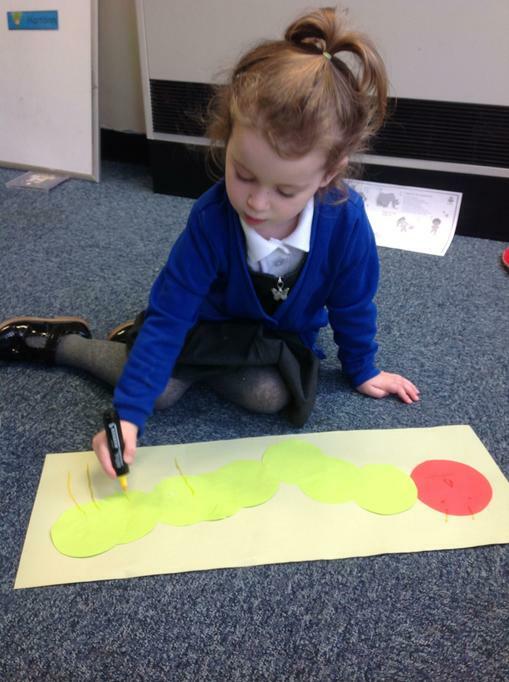 As part of Maths Week we read the story of The Very Hungry Caterpillar. We counted all of the different foods the caterpillar ate. 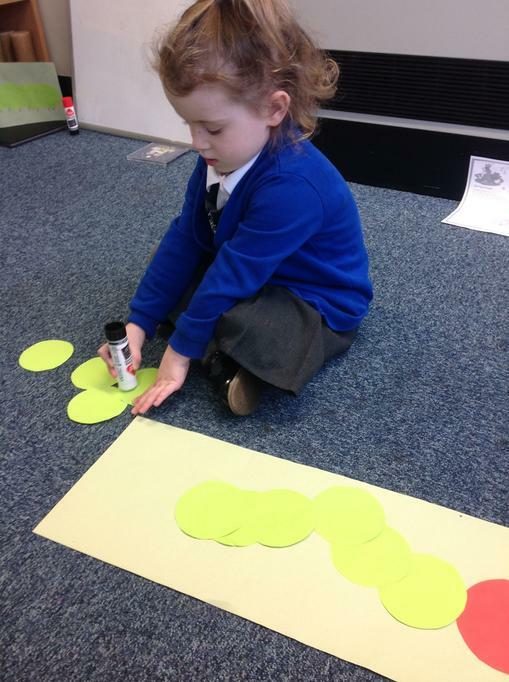 We made our own caterpillars using playdough, paper circles and paper loops. 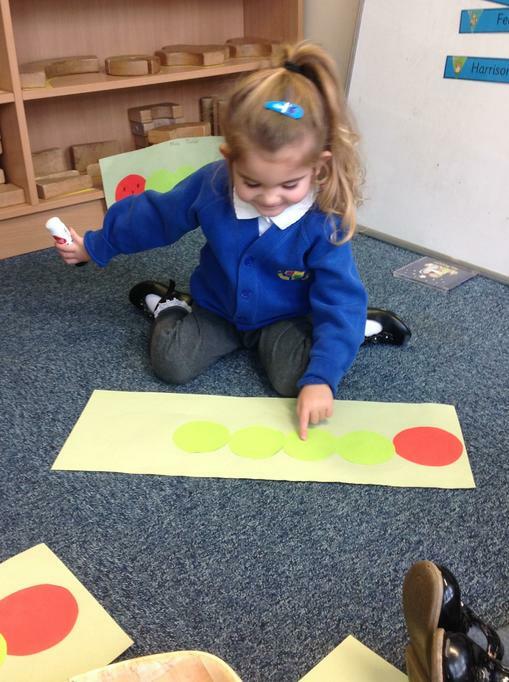 We were great at counting! We thought about the colours and shapes of the fireworks we had seen and decided to make some pictures to represent them. We saw long lines, curly lines, star shapes and splashes, so we used paint to recreate the images. 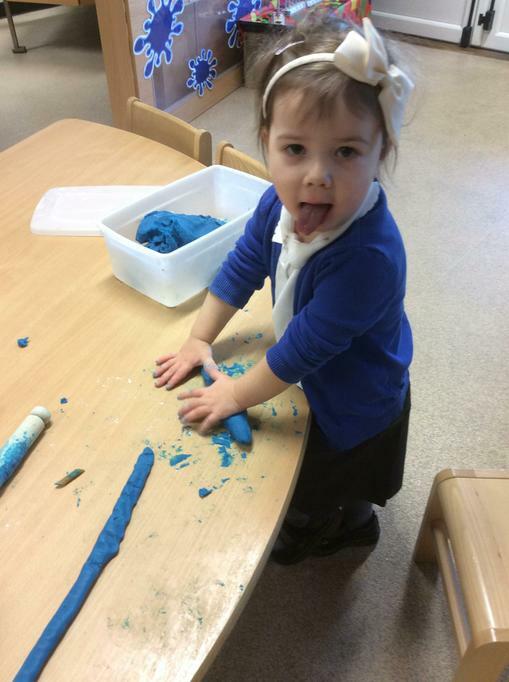 The children had lots of fun with paints and chalks and did some fantastic messy play mark making! 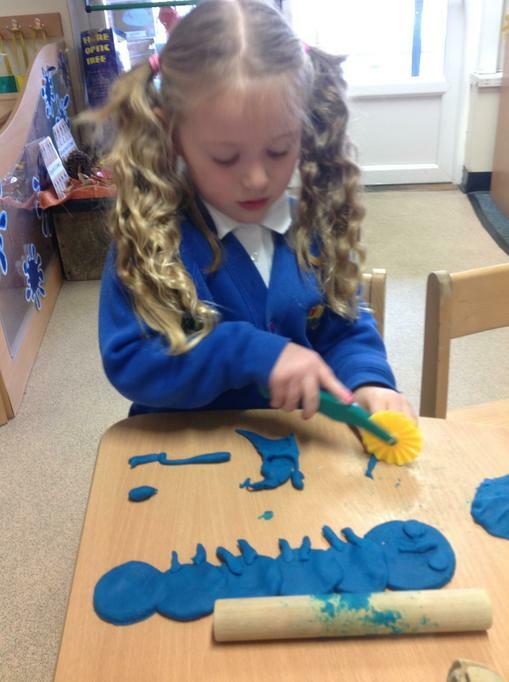 Working together in the playdough. Finding potion ingredients in the forest. Cutting 8 legs for a spider! Thank you to all of the parents and carers who attended our Stay and Play session today. It was wonderful to see so many of you supporting your young children during these early stages of their learning journey!